Practically everyone I know looks forward to Thanksgiving. It’s one of the few times you can get together with family or friends to catch up on each others’ lives and reminisce, and of course watch a little football. 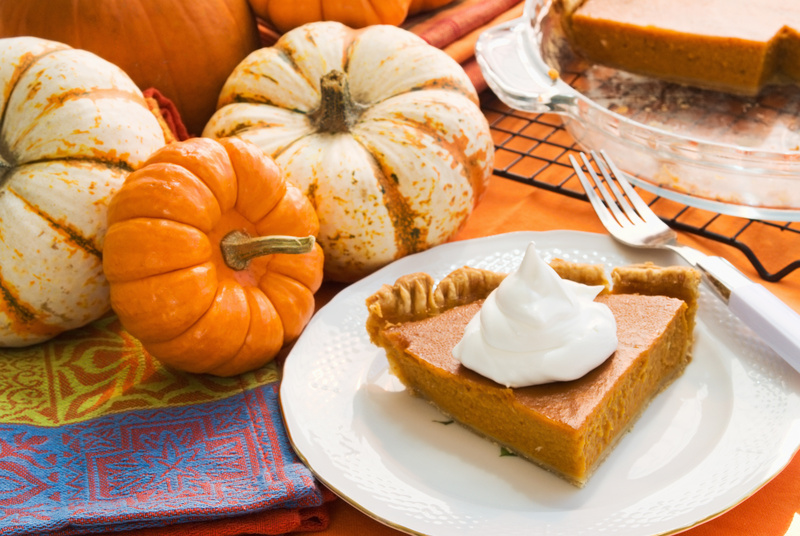 But, let’s be honest the main attraction is the feast… turkey, stuffing, mashed potatoes & gravy, pumpkin pie topped with real whipped cream… oh, yeah! Sure, you may have to loosen up your belt a bit (or change into your lounge pants) after indulging in all the glorious food, but you can always diet for days afterward to cancel out all the calories you’ve consumed. That’s what I tell myself anyway. My family has been hosting this holiday for years. At first it seemed a little daunting and stressful, but now that we’ve got it down to a science, we actually enjoy it. Besides, everyone contributes something towards the meal. We’re just responsible for the turkey, stuffing, potatoes and gravy. Of course, we need to take care of all the preparations, too ― shopping for groceries and other essentials, thawing the turkey (I buy frozen because it’s cheaper), cleaning the house, setting the tables and getting up at the crack of dawn to stuff the bird and throw it in the oven. Fortunately, my husband and kids pitch in and somehow it all comes together in the end. If this is your first time hosting and you have no clue what to do, don’t sweat it. I’ve got some tricks to help make your turkey day a success. Plan ahead. This is a must! I decide on the menu weeks in advance and ask each guest to bring something, like a side dish, salad, rolls or dessert, oh and a bottle of wine (you can never have too much wine). From there, I make a list of the things I need to buy and shop around for the best deals. Stores generally offer discounts on turkeys, breadcrumbs for stuffing, and other popular Thanksgiving fare days or even weeks before the holiday. Thaw the turkey. If you do get a frozen turkey, you’ll want to purchase it a week or more in advance. The reason being it takes about 5 days to thaw a 20-24 lb. turkey in your fridge. The folks at Jennie-O have some tips on how to properly thaw a frozen turkey. Make sure there’s enough tableware. We tend to have a big crowd every year (25-28 people), so I usually end up borrowing extra plates, glasses, silverware, serving bowls, and platters from a relative or friend. I don’t worry about them matching. Everyone will be so busy eating they’re not going to notice (or care)! Besides, mixing different patterns and colors make your presentation a little more interesting and avant-garde. Tidy up the house. I de-clutter and clean the house, at least the rooms my guests will see, in stages. Otherwise, it can be too overwhelming. I do the dusting and vacuuming a day or two before the event so everything stays clean. A word of advice ― recruit family members to lend a hand, even if you have to bribe them! Set the table the day before. It gives you one less thing to do on Thanksgiving Day. I cover them with nice tablecloths (if I need extra, I’ll borrow one or two from my mom or sister-in-law), and place napkins and silverware at each place setting. I also make sure I have salt & pepper shakers at each table. 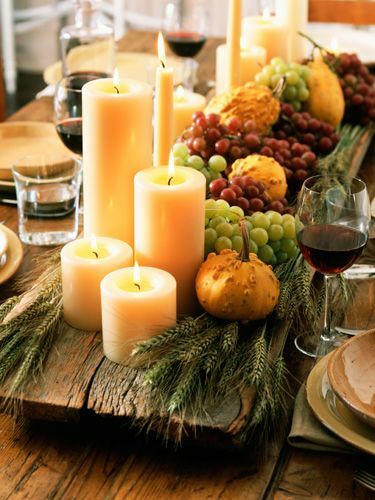 As for the centerpieces, I create my own with candles, miniature gourds & pumpkins, and different colored leaves. Need some inspiration? 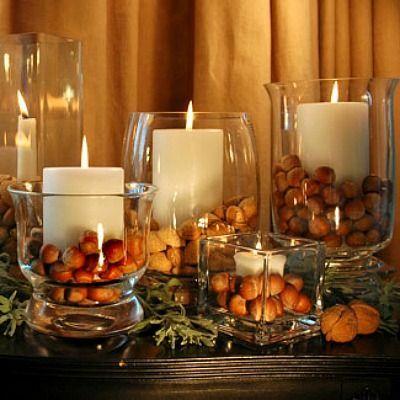 Check out these do-it-yourself centerpieces on Pinterest. Timing is key. This is where it gets tricky. You have to figure out how long it’s going to take to prepare everything (turkey, potatoes, gravy, sides, etc.) so the whole meal is done at the same time. It helps to do what you can ahead of time and have your guests bring pre-cooked or pre-made items so all you need to do is heat them up in the oven or microwave, or keep them chilled until you’re ready to eat. Start with the turkey as it takes the longest. Usually the packaging includes cooking instructions. If not, you can look them up online at www.allrecipes.com. It also depends on whether or not your turkey is stuffed. Some people prefer to have the stuffing outside of the bird, but our family has always cooked the stuffing inside the turkey. Either way be sure to remove those little bags of giblets (heart, liver, neck, etc.) from the turkey before you pop it in the oven. In fact, you may want to cook up some of those little gizzards and add them to your stuffing to make it more flavorful. 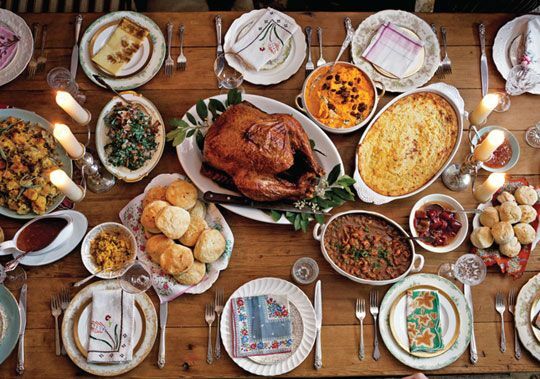 Here’s a recipe for classic giblet stuffing from Better Homes & Gardens. Make it casual. We have our guests arrive early in the afternoon for “social hour” with wine and cider, and some light appetizers (crackers & cheese, veggies & dip, etc.) before dinner. The main meal is served buffet style ― it’s less formal and more manageable. My husband carves the turkey and everybody dishes up their own plates then finds a place at the table. Take time to enjoy the meal and each others’ company. In fact, we don’t start clearing the table until everyone is finished. Most of the time we’re all so stuffed after the meal we wait an hour or two to have dessert, giving us time to relax, catch up on the game, or take a stroll around the neighborhood. Ask for help. I find that people (in my case it’s the women) are always willing to help out, whether it’s setting out the food, clearing the table, or doing the dishes. We talk and laugh a lot in the process so we don’t mind being stuck in the kitchen while the others are sacked out on the sofa. Finally, don’t panic! I decided a long time ago not to fret over things like lumpy gravy or mismatched silverware. After all, it’s dinner with your relatives or friends, not the royal family! Here’s to a happy and stress-free Thanksgiving! Click here for Free Thanksgiving Chalkboard Printables. Blogger Catherine B, a Smart Perks employee, enjoys a good Riesling with her turkey.